When you add a modern page to a site, you add and customize web parts, such as Microsoft Forms, which are the building blocks of your page. 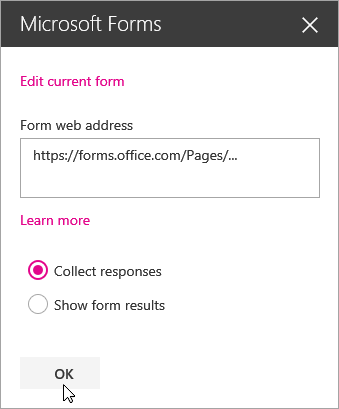 With the Microsoft Forms web part, you can add a form or form results to your SharePoint Online page. Click + to see a list of web parts to choose from. 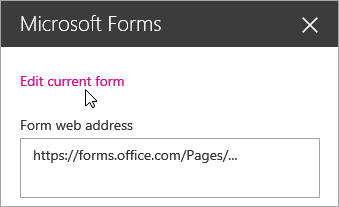 Click the Microsoft Forms web part. Do you want to add a new or existing form to collect responses? In the panel on the right, provide a name for your new form. Microsoft Forms will open in a new tab. Learn how to create a form. When you're done creating your form, go back to your SharePoint Online page. Make sure Collect responses is selected, then click OK to refresh so you're seeing the most updated content. Note: The web address of the form you just created will already be populated in the Form web address field. 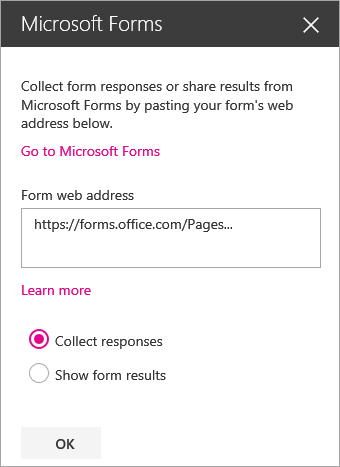 If you want to share one of your own forms, go to https://forms.office.com and open the form you want to share on your SharePoint Online page. Copy the web address from the browser's address bar. 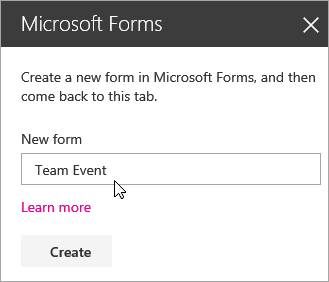 Note: In Microsoft Forms, you can also go to the Share tab. Under Send and collect responses, click the Copy button to copy the web address of the form. Go back to your SharePoint Online page. In the Form web address field, paste the web address of your form. Tip: Click CTRL+V to paste the web address. Note: You can also paste a web address someone has shared with you into the Form web address field. Make sure Collect responses is selected, then click OK to refresh the page and see your form. On your SharePoint Online page, hover to the left of your Forms web part and click the Edit web part icon. In the panel on the right, click Edit current form to make changes to your form. Once you have collected responses, you can now view results. In the panel on the right, select Show form results. Note: Under Form web address, the following message is checked by default: A web address will be created. Anyone with it can view a summary of responses. Microsoft Forms will generate a web address for this survey’s result sharing. You can share the web address with anyone to view this survey’s summary of responses. Note: Only form owners and/or co-owners can generate the web address to share. 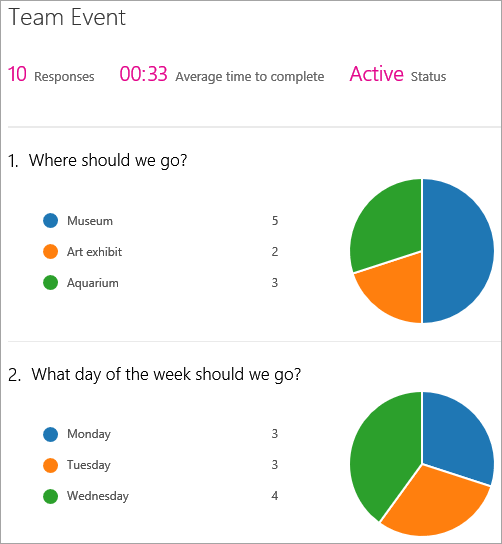 You can now view a summary of responses right in SharePoint Online.